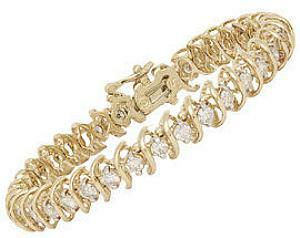 4 Carat Total Weight Diamond Swirl Tennis Bracelet. - This spectacular tennis bracelet shimmers with four full carats of brilliant round diamonds. Gleaming 14 karat yellow gold provides a strong and secure setting for a glowing river of diamonds.